Hundreds of fans, who braved sweltering temperatures in London's Leicester Square, were rewarded with an hour-long walkabout by the film's stars. Dead Man's Chest, which opens in the UK later this week, reunites the cast of the hit 2003 original. It also stars British actors Jack Davenport and Bill Nighy. 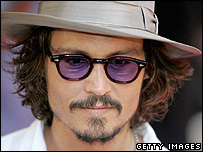 Depp, who reprises his role as the Captain Jack Sparrow, wore a cream Fedora and shades to protect him from the sun. He was greeted by lines of screaming fans, some of whom had camped out overnight. Many dressed up as pirates and waved placards, while being sprayed by security guards with water to keep cool. Knightley, 21, who was wearing a bronze Gucci dress slashed to the navel, said it was "lovely" to be in London for the European premiere. "We had such a good response in the US, but I'm a London girl so it's always special to do a premiere here." Knightley said she was thrilled to be reprising the role of the aristocratic Elizabeth Swann - especially the challenge of doing many of her own stunts. "I was desperate to have swordfights all the way through and they actually gave me one in the second film, but I don't think I was very good. I didn't get as many as I thought I would. "I really do love action and I think if you are doing an action film, you should do as much of the action yourself as possible." Kevin McNally, who plays Gibbs, said it was great fun working on the sequel. "Everyone on the movie was exactly the same as on the first one - it was really like coming back after school holidays," he said. "The camaraderie from the people who make the films comes over in the movies which makes them so sparkling." Dead Man's Chest - which follows on from 2003's Curse of the Black Pearl - sees Captain Jack Sparrow find out that he owes a blood debt to the legendary Davy Jones, Captain of the ghostly Flying Dutchman. Jack must find a way out of his debt or else be doomed to eternal damnation. Bill Nighy, who stars as the half-squid, half crab Davy Jones, said it was a great character to play. "He's a very seriously spooky guy, his job in the movie is to put the fear of God into everybody, notably Jack Sparrow," he said. "But I don't know why, when they were looking for a half-squid, half crab, my name came to mind. "I'm going to choose to take it as a compliment otherwise I would have to kill myself." The Office star McKenzie Crook, who played Ragetti in the first film, said it took "no convincing at all" for him to return to the part. "It was great to be in the first one, and the chance to be in the trilogy is just an actor's dream," he said. "It's the sort of film that kids will watch over and over." But Crook refused to be drawn on what audiences can expect from the last film in the trilogy, which is due to be released next year. "My character ends up running off with Keira Knightley so there's a bit of romance... no, of course not. I can't say anything - I'd have to kill you." Producer Jerry Bruckheimer said the film was always designed to be a trilogy. "It's a continuation of a story and if you tell a good story people will come and see it." The third Pirates film, shot at the same time as Dead Man's Chest, will be released next year.